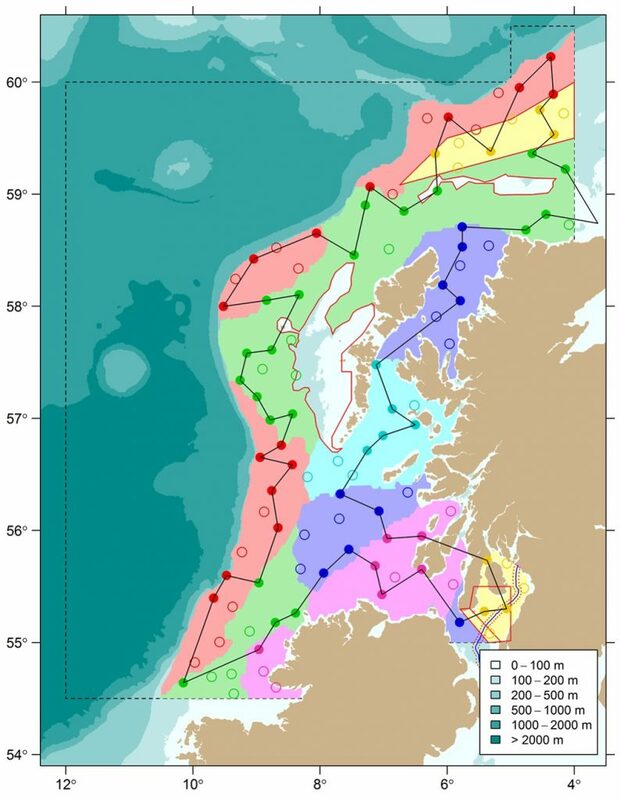 Fishing Gear: GOV (Grand Overture Verticale) Trawl (BT 137) fitted with ground gear D.
Demersal trawling survey (SCOWCGFS-Q1) off the grounds of the north and west of Scotland in the International Council for the Exploration of the Sea (ICES) Subarea 6a. Obtain temperature and salinity data from the surface and seabed at each trawling station. Retrieval and re-deployment of Compass moorings located at discrete sites within the survey area. Opportunistic use of the Gulf 7 icthyoplankton sampler in support of the triennial mackerel egg survey (MEGS) to determine densities of target species within the survey area. This is a random-stratified survey design with trawl stations being distributed within 10 predefined strata covering the sampling area (Figure 1). A total of 62 primary and 45 secondary stations have been generated (Tables 2 and 3, respectively). 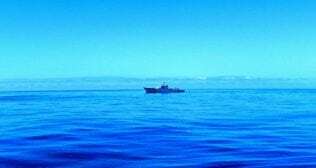 The intention is for the 62 trawls to be undertaken on suitable ground as near to the specified primary sampling positions as is practicable, and where possible within a radius of five nautical miles of the sampling position. In the event that trawling is not possible within 5 nm of any primary station then the nearest appropriate secondary station will be used. Hauls will be of 30 minutes duration unless circumstances dictate otherwise. Where possible, fishing operations will be restricted to daylight hours. The Scanmar system will be used to monitor the headline height, wing spread and door spread for each haul. Bottom contact data from each trawl will also be collected using the NOAA bottom contact sensor, which will be mounted on a bar in the centre of the ground-gear. In addition to the routine sampling, biological data will be collected for target species in line with the EU data regulation. All fish will be processed in accordance with the protocols as described in the Manual of the IBTS North Eastern Atlantic Surveys. Series of ICES Survey Protocols SISP 15. 92 pp. 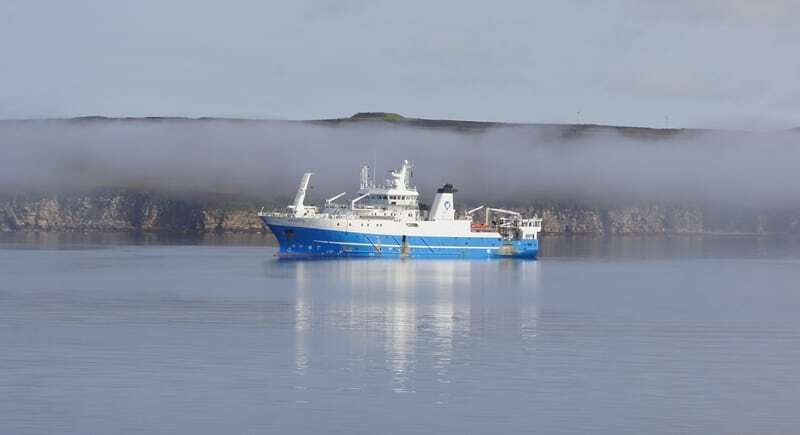 A CTD cast will be taken at each trawl station, weather permitting. Top and bottom temperatures will be reported and in addition a calibration sample will be retained from the surface. Six acoustic moorings were deployed at sites within the 0318S survey area during 2018. Two days have been allocated from this survey in order to retrieve and redeploy these moorings. An acoustic release system will be deployed from the vessels side deck to trigger each mooring which will then allow it to surface where it will then be retrieved again from the side deck. Re-deployment of moorings will be undertaken from the side deck. A table and map providing the mooring locations can be found below in Table 1 and Figure 2 respectively. Oblique tows will be carried out opportunistically and during trawl and mooring downtime using the Gulf 7 sampler. 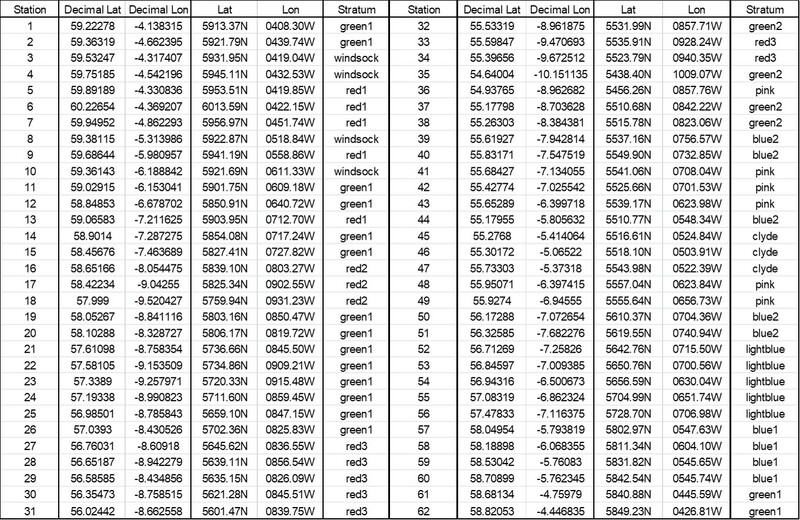 The intention will be to collect where possible one sample within each half statistical rectangle bisected vertically (eg 45E1W/45E1E). The daily sampling plan will be discussed and then decided after consultation with the Captain and Fishing Master. 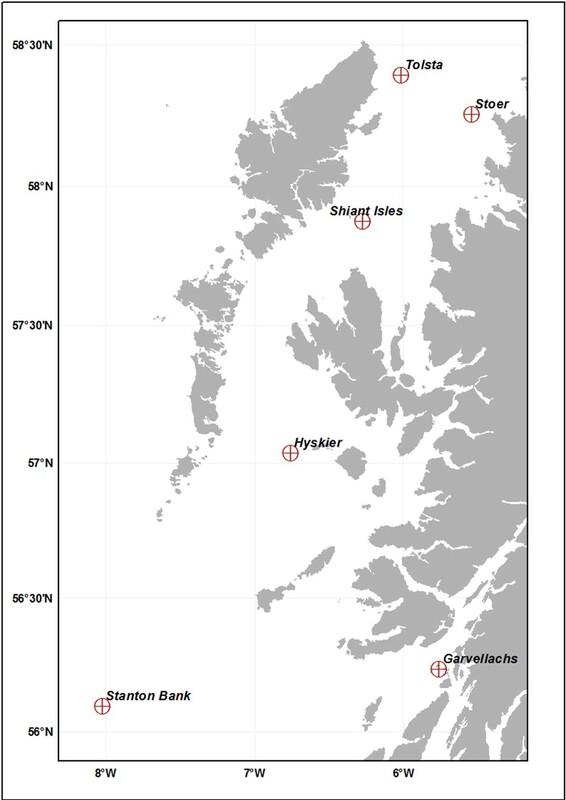 Figure 1: 0319S (SCOWCGFS-Q1) – 2019 ICES Subarea VIa Survey Strata showing primary (filled circles) and secondary trawling stations (open circles). A potential survey route is also provided.